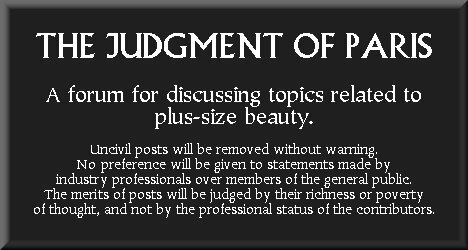 The Judgment of Paris Forum - Happy Thanksgiving! Happy Thanksgiving to everyone in Canada. And to everyone in the U.S. Happy Columbus day! 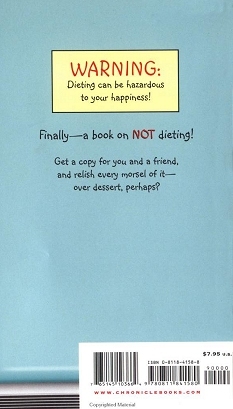 Just as a little bit of encouragement for everyone to enjoy the holidays to the fullest, a reader sent us a link to an amusing little book titled, 365 Reasons to Stop Dieting. The book could alternatively be titled, 365 Reasons to Stop Diminishing Your Beauty. Hopefully, among the 365 listings are reasons such as, "Alluring attire looks better on curvaceous figures," and "Fuller facial features are far more attractive than a gaunt visage." But how wonderful that we can now add the following reason to the tally: "You can become a plus-size supermodel and walk the runway at a major Paris fashion show."